Did you ever try to catch a mouse with a coconut? Let me guess. 'NO', probably - set aside why the hell someone would even think about doing such a thing. Well, actually, I do. And let me tell you, there are even many ways to catch mice with a coconut! There's the brutal method, for example - which also works for rabbits, goats or even small tigers. It's very simple: try to get as close as possible to your target and launch the coconut as hard as you can. If properly done, you'd be able to make this a winner. If not, I hope you're a better runner than a launcher. Then there's the patience method. Cut the nut in half, remove the bounty-stuff, put a snack in one half and stay calm & quiet, as long as it takes. The mouse will come, no worries, to steal that tasty snack from you. Sure. 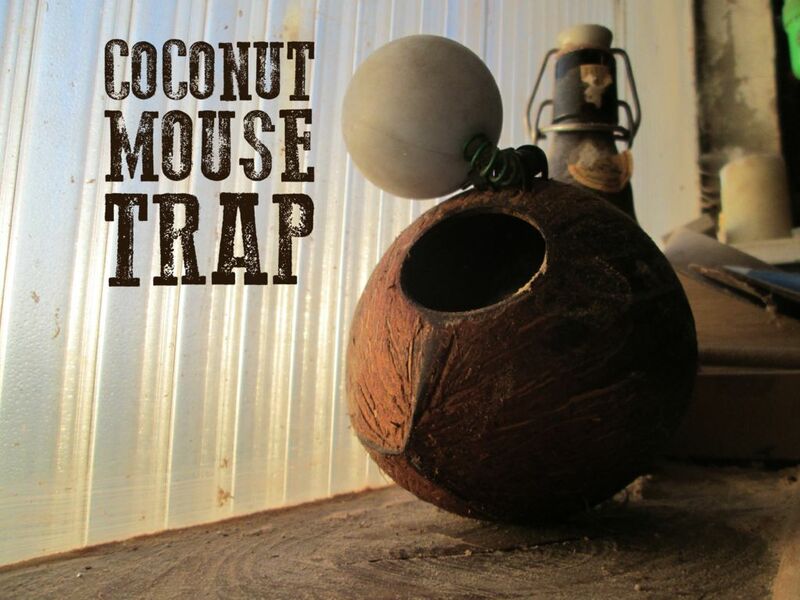 All you have to do is smash the second half of the coconut as fast as you've ever done on the first half - hollow side on hollow side, otherwise you'll have mouse-mash - to trap the animal. There's also the vicious method - which I'll explain more deeply here. In this method there's no throwing technic needed, no agility required and there's no danger to hurt the animal. It's just basic craftmanship and a few crazy shortcuts. What you need for this project is ridiculously simple: a coconut, a clothespin, an empty plastic tube and a bit of cord. And a pot of peanut butter, of course. Important detail: this is a life-trap. Goal is to catch the mouse alive, not to hurt or kill it. Its concept is inspired on a very old - and very effective - design (see picture). Mickey will come, guided by the flavor of the snack hidden in the trap. He will enter the trap, and see that the only obstacle between him and the snack is just a ridiculous piece of cord. He will destroy it, of course, activating the mechanism which will close the door behind him. I love these traps. With the ol' design I catched many dozens of mice - with the coconut the fun has just started. But it works, wonderfully! Every day I take my box filled with mice and go to a farm a few kilometers away to set them free. A life is a life, and if it's not to catch it for food there's no reason to take it. You need that coconut. The bigger the better. Clean it up and drill two holes in it. One at the top, one at the tip. Remove the meat and done you are. Initially I wanted to hack a clothespin, but I realised very fast that this was just a stupid idea. So I went into pingpong balls. Less cool, much more effective. Attach a small, but strong, spring to the ball - screw it just in the ball - and attach the other end to the coconut. The keyword here is precision. The ball has to be pushed firmly & tightly to the hole. No error tolerated, otherwise Mickey will escape and your trap will be his best joke. No ball? You can make a small door with a tiny hinge - Hobbit-style - if you want. Medicine tubes are the dreamed objects to use in this project. I got lots of headache, so finally I found a way to recycle all those empty tubes. Exit the stuff that will keep the pills dry and cut 1/3 of the lenght. Use some tape to screw it tightly in the tip of the nut. Time to arm the trap! insert a piece of cord all the way through the trap, attach it to the ball and pull the ball backwards. Mickey will come, enter the trap, bite the cord and get himself trapped. Awesome, and effective! Can't wait to free the next one. i can understand a farmer, seeing someone releasing mice onto his farm, using a firearm in an extremely unfriendly manner. Haha, the last farmer has left this world a few years ago - only abandoned buildings, rusty gear and beautiful silence! ----but the farmers leave poisons for the creatures that invade the land. If you care for the mice, move them to a wilderness, or better yet keep them in your home, and feed and live with them. They live where there is food, and we have food. You must feed them to keep them away from harm. Like it! How do you handle any rodent visitors, btw? Speedy dogs? This means they are not desired by humans to have around their homes or farms due to disease, food thievery and chewing destruction which when coupled with electrical cables can be very costly and a potential fire hazard. This is why we don't generally keep/feed them. If a farm is abandoned then it is practiacally wilderness, a large stretch of unoccupied land. i was being sarcastic about keeping the vermin as pets. I have killed many mice, but my cats have killed more. They are foul creatures who should be killed at every opportunity--unless they can serve in a laboratory. I usually put (sarcasm) on the end just so people can tell when I'm being sarcastic on the inter webs. I wouldn't go that far O.o they are still part of the natural ecosystem and its more our fault (by providing motivation for them to breed and live near us by keeping food and waste insecure and available) if they get out of hand and spread disease. In the wild mice fulfil a very important role by creating the link between plants and predators. The diverse range of mice species sustain many different and beautiful predators like Raptors (Buzzards, Tawny owl), stoats, weasels, foxes, without mice these would massively decline in numbers, possibly one problem with mice is the decline in habitat for predators so the mice population isn't kept in check. They also being herbivores help manage greenery and grasses by dispersing and eating seeds. I'm from England so am only really familiar with their impacts here but I am sure they hold great importance in america as well. Wilderness is a big word where I live. Most mice I catch are the so called 'house mice' (Mus musculus), which live in urban areas. They won't survive elsewhere. In parks, bushes, forests & fields there are other species, like the Wood mouse (Apodemus sylvaticus), Common voles, Bank voles etc. At the time I did a lot of catch & release to determine local diversity. Incredibly interesting. Even with many bites in my fingers. Here's a Field vole (Microtus agrestis) - a very snackyvorous species.